1. Bring in 4 large sheets of paper (poster size), enough pictures and glue. 2. Write “in”, “at”, “to” and “on” on the top half of each sheet. 3. Spread the pictures and put students in small groups. 4. Each group chooses some pictures and decides on which poster the pictures should go. 5. If they choose the right preposition one of the group can glue the picture on the poster. 7. Have every student write down a sentence on the board (or another large sheet of paper) using the appropriate preposition of time. The present printable, downloadable handout is intended for business/professional students, high school students, elementary school students and adults at Elementary (A1), Pre-intermediate (A2) and Intermediate (B1) level. 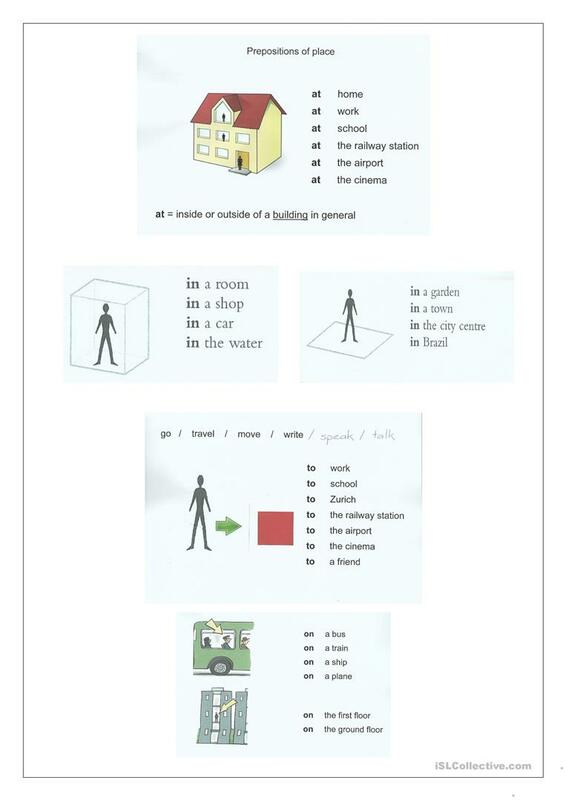 It is a useful material for consolidating Prepositions of place in English, and is a valuable material for developing your class' Speaking and Writing skills.